Thank you for all your help and determination. I would like to take this opportunity to thank Ivy Public Adjusters. Without your experience and assistance I wouldn’t have gotten my insurance company to pay for the damage to my home. I am very thankful for your services and will continue to recommend Ivy Public Adjusters to anyone needing your services. I had a main pipe break in my home that caused major damage. After numerous calls to my insurance company and being told I was only covered for some of the damage I called Ivy Public Adjustment. They immediately came out and assessed the damage and contacted my insurance. With their help I was able to make all repairs and got the maximum from my insurance. Thank you Ivy, I couldn’t have done it without you! The staff at Ivy Public Adjustment was awesome. This was our first Homeowners claim and it was a big one, for a roof. Throughout the entire process Ivy was very informative and attentive to our many questions. They took the time to explain the details of our policy, the negotiations, and the settlement. We could not have done it without them and the settlement we received was substantially more than we ever could have imagined. Additionally, the payment process was fast so there weren’t a lot of out of pocket expenses before repair. -Tim & Ann Marie H.
I would like to share my experience with you about hurricane Sandy. I did not live in the direct path of Sandy, but sustained major damage as a result of the storm to my house. Having had homeowner’s insurance for over 35 years but never using it, I was kind of in the dark about what to do. 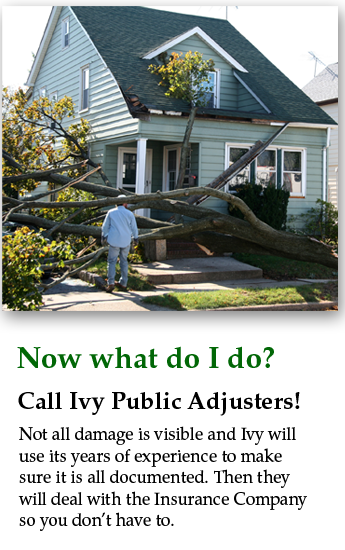 I decided to call Ivy Public Adjustment Company. They came out to assess the damage within 1-2 days of the call. They explained my rights under my insurance policy, and handled all of the details. Within a few weeks, I had a check from my Insurance company, and my house was repaired. They also took care of my follow-up concerns and made sure I was completely satisfied with all of the results. Do not think that you can understand all of the fine print in your policy. Insurance companies are not your friends in these situations. Call Ivy with your claims first, and you will see results fast and be completely satisfied.